Seems that I misjudged the gloom of a gray Friday morning as I set out on a bicycle trip to Sebastopol, because the light rain forecast for later that day begins before I'm halfway out of Santa Rosa. By the time I reach the door of Spirit Works Distillery, I'm drenched from a cold, steady rain. That's just as well, for I'm here to taste single malt whisky, and now I'm feeling properly Caledonian. The birth of Scotland's national poet, Robert Burns, is celebrated in that nation, and here and there around the world, on Jan. 25. While the proper tipple for that occasion must surely be "Scotch Drink," to which the poet dedicated one of his famously feisty, merry odes, I want to know if I can find a local version here in the craft-brew-crazy North Bay—after all, beer is made with the very same stuff: malted barley. I'm on a path with few fellow travelers. "Ninety percent ask for bourbon," says Lauren Patz, head distiller at Spirit Works, of the customers who want to know what else they've got besides wheat and rye whiskey. As for the other 10 percent, "They ask if we make Scotch. They don't ask us if we make single malt." It's a distinction with a difference: Scotch whisky comes from Scotland. Single malt is a category of malt whisky that comes from a single producer, most notably but not necessarily one in Scotland. At Spirit Works, Patz has a few samples of hidden gems waiting for me: one, distilled last year from California-grown barley and sweetly reekin' of charred oak and spice, is very "Spirit Works" in character, much like their wheat whiskey. Another, at three and a half years, is smoothed and deepened by time. They're holding this one back until later in 2019. “They’re the hidden gems,” Patz says of local single malts tucked away in cellars that are bursting with bourbon and rye. Indeed. At Moylan’s Distilling Co. in Petaluma, head distiller Tim Welch disappears in the stacks with a Post-It note in hand, after consulting a computer to find where last year’s batch of peated single malt is hidden. He reappears walking one way; then disappear the other way. Finally, he locates a barrel hidden in plain sight and hammers the wooden bung open. It’s made from peat-smoked malted barley imported from the UK, and it's spry and heathery, like a young Highland Park from Scotland's Orkney Islands. When Welch retrieves a seven-year-old sample aged in a sherry barrel, the aged savor of raisins, leather, and wood takes me on a flight of fancy to my beloved Glendronach from the Scottish Highlands. Moylan’s current single malt offerings are aged in port and orange brandy barrels. Mike Griffo also likes Highland whiskies: “Like, most of the Glens.” At Griffo Distillery in Petaluma, he focuses on gin and rye, but he’s brought out a sample of a young malt that’s earthy and dry, and demonstrates how his high-barley recipe for his Stony Point bottling, technically a bourbon, firms up the sweet corn. Distilled from a Henhouse Brewing beer, Belgian Hen is lightly hopped and slightly biscuity. 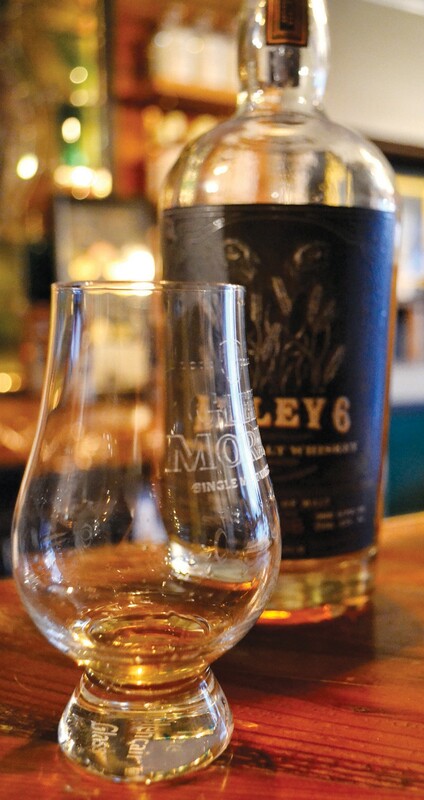 At Alley 6 Craft Distillery in Healdsburg the latest single malt is hard to resist. Sappy and creamy, with vanilla and butterscotch notes, it's a hint of Glenrothes without so much as a day spent in a sherry cask. Distiller Jason Jorgensen is amused by the bias that some craft spirits observers have against the faster, small-barrel system of aging whisky he employs. "I get a kick out of it," he says. His view is, it's a short life, why wait for this pleasure? Surely Burns, who lived lustily until 37, would agree. Healdsburg's Camellia Inn hosts its annual Burns Supper on Feb. 23. Literary-minded guests can expect song and recitation of Burns classics, while the literal-minded should note that the drinks menu is very strictly limited to wine and beer. For info, call 707.433.8182. Tags: Swirl, Alley 6 Craft Distillery, Moylan’s Distilling Co.